This piece is intended to be a short essay on the current global crunch as I see it. I'm writing at this point, because current wisdom says that the Global Crunch won't be as bad as the Great Depression of the 1930s. Here I'm going to do a comparison between market collapses in the 20th century and the current situation. I won't say much about any predictions. What to call the Global Crunch. A Comparison with the Crash of 1929. A Comparison with the Recession in the late 1980s. I think inevitably, this crisis will become known as "The Global Crunch"; at the time of writing, it's variously referred to as "The Credit Crunch" or the particularly lame "The Downturn" used by BBC News. Many of my references are taken from the Wikipedia. The 1929 Crash was a culmination of 5 years of massive stock market growth which was ultimately boosted by heavy speculative investment. 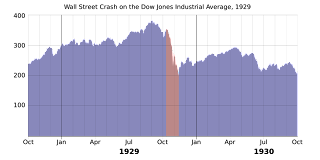 The market initially recovered over the next several months of 1930, but this was not enough to prevent the subsequent Great Depression and corresponding global recessions in Britain and more importantly in Germany (where the economic (and social) instability lead directly to the the rise in power of extreme political parties and subsequently the Nazi dictatorship and World War II). The Great Depression was exacerbated by nationalistic protectionist measures following the crash; hyper-inflation in Germany; and the road to recovery was only initiated by the implementation of Keynsian Economics in Japan; the US (the New Deal) and later in the UK to some extent. Note: Keynsian economics works on the basis that it is the flow of cash which produces wealth not the amount of it in anyone's possession. Ironically it was the World War II which propelled the US into the industrial leadership it maintained at least until the early 21st century. The Great Depression was followed by several decades where national economics were heavily regulated by Government. The 1987 Crash. Again, the crash of late 1980s (and the subsequent 1990s recession) can be seen as a product of market deregulation that began in the early 1980s with the Reagan/Thatcher free-market era. In this case, the UK changed its laws to allow less heavily regulated stock markets; which lead to London re-emerging as a global financial centre as financial interests moved from Europe and the US to the UK. The US subsequently started to change its regulation. In 1986 the UK chancellor Nigel Lawson further deregulated the markets which lead to the Boom of 1987. 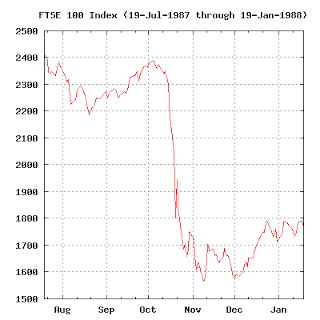 The 1987 Crash in both the UK and US was precipitated by the large number of stocks managed by simplistic computer programs which automatically sold their shares under certain conditions - therefore since the same programs were being used everywhere, it was possible for an extremely rapid crash (actually at a far greater rate than in 1929) to take place. In the months proceeding the crash it looked inevitable that the country would head into a recession of some kind; though the government repeatedly asserted that this was not going to happen. Of course, this was not the case and a recession did indeed follow a few years later and at it's height in 1991-1992 was responsible for a high number of repossessions from unsustainable mortgages from the Conservative housing boom of the mid to late 1980s. So, when we come to look at the Crunch we actually see the hallmarks of previous crashes all over again. We see deregulated markets leading to a financial boom and subsequent serious bust. We see the effect of housing and mortgages on the whole financial outlook (the deregulation of the housing market in the US: the Subprime market and in the UK being very similar to that of the 80s); excessive speculation and loans (where capital / loan ratios were increased). On top of that we have constraints due to fossil fuels becoming a constraint on the economy and the undermining of the western economies by a number of unnecessary wars. What we can predict is that this is only the start of the problem. If the past is anything to go by we can see that market collapses usually impact people for at least the next 5 to 10 years - it's unlikely we'll be at 2006 - 2007 levels by 2013 (5 years from now); it's likely that, given that economic pundits are telling us that there will be a significant recession for a few years that in fact it will be worse than in 1987 (because then they said it wasn't going to happen at all)! I'm publishing this the day after the Dow Jones fell to 7553.8 - a fall of 46% compared with its height of 13900 about a year ago (the 1929 crash was a fall of 43% compared with its height). but this was not enough to prevent the subsequent Great Depression and corresponding global recessions in Britain and more importantly in Germany (where the economic (and social) instability lead directly to the rise in power of extreme political parties and subsequently the Nazi dictatorship and World War II). Ironically it was the World War II which propelled the US into the industrial leadership it maintained at least until the early 21st century. Yes. This is accepted by many historians. Some trace it back to the ending of World War I. We see the effect of housing and mortgages on the whole financial outlook (the deregulation of the housing market in the US: the Subprime market and in the UK being very similar to that of the 80s); excessive speculation and loans (where capital / loan ratios were increased). On top of that we have constraints due to fossil fuels becoming a constraint on the economy and the undermining of the western economies by a number of unnecessary wars. What we can predict is that this is only the start of the problem.